We spoke with Professor Hiroko Ota of the National Graduate Institute for Policy Studies and chairperson of the Economy and Technology Commission of the Tokyo Organising Committee of the Olympic and Paralympic Games regarding how Japan will change ahead of the Tokyo Games. A group of Japanese companies has been working to develop and improve state-of-the-art rail systems in Rio de Janeiro and beyond. 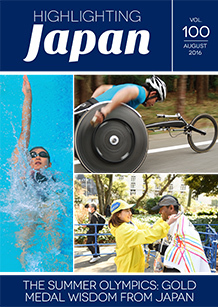 Some 80,000 people are expected to volunteer their assistance in the day-to-day running of the 2020 Tokyo Games. Panasonic is developing a multilingual translation system that promises to be a world-beater by the time of the Tokyo Olympic and Paralympic Games in 2020. How a small Japanese manufacturer's racket-stringing machines came to be used in three consecutive Olympic Games. Wheelchairs for athletes custom-made by Japan's OX Engineering Co. are favored by many Paralympians around the world. Four-time Olympic gold medalist Kaori Icho is promoting international exchange through her sport, freestyle wrestling. Mayumi Narita, a fifteen-time gold medalist swimmer competing in her fifth Paralympic Games this summer, continues to embrace and promote "the amazing power of sports." A new material that can measure biological information such as heart rates and electrocardiograms is finding utility in fields as diverse as sports training programs and security management. Richard William Heselton has been practicing karate in Japan for more than twenty years. Sculptor Kohei Nawa, a contributing artist in the "Tokyo Caravan" event being held worldwide in the run up to the 2020 Tokyo Games, produces work that challenges conventional notions of production and perception. The Tsuboya-yaki pottery production methods of Okinawa Prefecture have remained unchanged since their introduction 400 years ago. Summertime on the Noto Peninsula in Ishikawa Prefecture is celebrated with a variety of distinctive lantern festivals.